Cold War paranoia may have eased up on the Space Racedecades ago, but a new report finds that military projects still take up nearlyhalf of all spending worldwide on space assets. The United States is by far the biggest spender on defense-relatedspace programs, yet its technical savvy also makes it the country mostdependent on such systems, according to a report, "Space Security 2010,"released in September. American efforts to project military power across the globehave helped drive such dependence on space power, said military and securityanalyst John Pike, who runs GlobalSecurity.org. That dependency may leave the U.S. most vulnerable toanti-satellite measures aimed at taking out the country's watchful orbitalplatforms. While the U.S., China and Russia have perhaps the most advancedcapabilities for destroying satellites, India also has announced plans todevelop anti-satellitecapabilities. According to the new report, the U.S. Department of Defenseallocated $10.7 billion to boost space-based capabilities in 2009. But thatfigure did not include money for the National Reconnaissance Office, NationalGeo-Spatial Agency, or Missile Defense Agency. Much of that defense spending focused on satellites that provideservices such as communications, intelligence, reconnaissance and surveillance,as well as weather forecasting, navigation and weapons guidance applications. The United States operated about half of the world's 175dedicated militarysatellites that were in space at the end of 2009, according to the SpaceSecurity Index, an international research consortium that compiled "SpaceSecurity 2010." Pike considered that count of U.S. military satellites"significantly low," and said a count of 115 satellites by the Unionof Concerned Scientists came much closer. Russia was said to operate a quarterof the military satellites with 38, and China had 12. The Russian number "sounds about right," Pike saidin an e-mail. He pointed out it is just a third of the total number of Sovietmilitary satellites that were aloft during the Cold War. U.S. dependence on space power goes far beyond dedicated militarysatellites. Many of its navigational and targeting systems also depend on GlobalPositioning System satellites that guide civilian smartphone users and drivers. 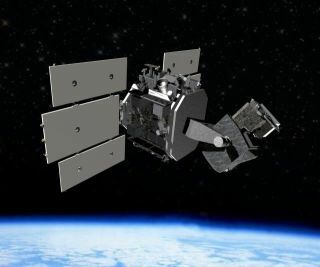 The Air Force launched the first of a planned fleet of 12 ultra-preciseGPS satellites in May. Russia has pushed forward its own GPS satelliteconstellation, called the Global Navigation Satellite System (GLONASS). Thathas its own budget of $1 billion. The U.S., China and Russia currently have the most-advancedground-based missile systems that can destroy satellites, according to thereport; the U.S. and China demonstrated theirs in recent years. In 2007, China shot down an ailing weather satellite with aground-launched missile, and the U.S. Navy shot down a defunct spy satellitewith a ship-launched missile in 2008. Russia showed indications of anti-satellite capabilities inthe 1980s. Such countries also have access to advanced laser programsthat could temporarily dazzle or blind the sensitive optics of satellites inlow-Earth orbit. During the Cold War, both the U.S. and Russia tried todevelop space-based strike systems that could attack Earth targets with nuclearweapons or lasers. But countries appear to have moved away from such "StarWars" systems in recent years. The U.S. space-based missile interceptorprograms have faced funding cuts as well, and so the U.S. military has focusedinstead on ground or airborne lasers. Some space technologies or capabilities may or may not havemilitary possibilities, depending on different national intentions andviewpoints. China's recent secretsatellite maneuvers probably represented tests of future space rendezvouscapabilities, analysts said. Yet a Russian news story suggested China could usesimilar maneuvers to inspect foreign satellites. The U.S. Air Force's X-37Bspace plane, currently orbiting the Earth, might allow the U.S. military toquickly replace satellites knocked out during a conflict. The space plane, too,has drawn speculation about secret military weapons, but such a role looksunlikely to analysts. For now, the United States appears likely to remain in thelead for space capabilities that support the military. That comes in part fromits current goal of maintaining military might around the world. "Until China discovers an urgent need to defend thePanama Canal from the Yanqui Imperialists, I don't see (it) developing globalpower projection capabilities of which space is an integral component,"Pike wrote. Its reliance on space capabilities leaves the U.S. military morealone in terms of vulnerability, if future adversaries decide to knock outsupporting satellites. "Space Security 2010" suggested that Russia alsohas an interest in preventing the development of systems that could threatensatellites, but Pike disagreed. "Russia does not have a China threat scenario, so I don'tthink they care," Pike said.